Here you’ll find our great recommendations for JugDog’s best dog harnesses for your Jug and other dogs of all sizes, please be aware that some may be suitable for puppies and others for adolescent and adult. Check sizes before your purchase. Harnesses are a great way to keep your Jug comfortable while out and about and won’t be hurt if they pull. Harnesses are ideal for the modern dog as it is much more friendly than taking them for a walk with a collar. 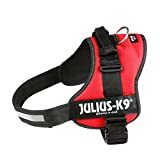 After carefully reviewing over 50 harnesses we’ve come to the conclusion that our recommended best dog harness is the Julius K9 harness (whatever size you need). We feel this harness does the best overall job and does well in every category. The price point is also very generous and a great return on your investment. Here at JugDog.co.uk we have taken great time to test each and every harness on this page thanks to the co operation of our Jeff and we’re pretty pleased with most of the harnesses brands have given us. However, not all harnesses are created equal and at the end of the day on a small selection can be hailed as ‘great’ or even the best. For those who have never had a harness before and wanted to know more about pros and cons we’ve also included that in depth here. We hope we are able to help you find the perfect fit for you and dog! What to look for in a harness? 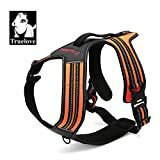 So with all of the different types and benefits of owning a harness it’s now time to list and discuss what we think the best dog harnesses are, to save you some time we’ve listed the better harnesses at the top with other choices towards the bottom to save you from having to read all of our writing. However, it must be said that when we say it is the ‘best’ dog harness it may not be the best dog harness for you and exploring all the options is a great idea. Remember to consider our list of what to look for in a harness to make sure it ticks all of the boxes for you. Some harnesses may be put in a category – for example one may be best for working dogs while others may be better suited for everyday walking or perhaps for smaller breeds. You may notice that this is the harness that our Jug, Jeff wears and still wears today. Originally this was a recommendation from fellow jug Harlow before we bought one for ourselves because we saw how the harness was still in very condition even though it had been used for a year at this point. It is robust and made up of a really tough material, it’s easy to put on with one very secure and durable buckle and take off and of course it looks great. The ‘handle’ on the back helps us pick him up and control him if we need it and the cleverly placed INOX ring makes it easy to attach to our car’s safety belt or a dog tracker if you have one of those. The one drawback is the reflective side panels aren’t quite reflective and it offers nothing in the dark which is a shame. Be sure to add your own LED strips if you want night time effects. It can take a beating and has lasted Jeff well over a year, it might seem expensive but in our eyes we won’t be needing to replace this for a long time. Julius K9 harnesses come in a wide variety of colours and sizes so it is a great harness for small dogs and large ones. The Ruffwear harness is a truly superb utility/durable harness which is best suited for adventures such as hiking, long walks and other rough and ready activities. The reason for this is because this harness has been designed to give greater range of motion to deal with changing speeds, directions and contact with the outside world. Its unique design also makes it easier and more comfortable to lift your dog over obstacles should you need to. 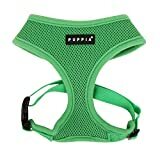 Shoulder, chest and belly straps are included for greater fit and comfort for your pooch so it definitely ticks that box – this harness will evenly spread force when pulling or when lifting the pet over the aforementioned obstacles. Lastly on the point of the design is that it is still pleasing on the eye despite all the extra bells and whistles it has over some of the other harnesses. The harness has strong, interwoven nylon straps which are constructed for strength without a weak point so to answer the question ‘will it last?’ then the answer is yes. The material is also heavily breathable so it won’t annoy your dog on extended walks (which it is designed to be used on). From a price point of view this harness isn’t cheap and is more on the expensive side. However, as it is classified as a ‘speciality harness’ this price seems fair – it’s not designed for every day quiet walk around the park use so this could be ideal in conjunction with another harness. Here at JugDog we highly recommend this harness for those who take long adventurous walks with their dogs and those who own active pooches such as Spaniels, Dalmatians, German Shepherds and Collies. The FIE (acronym for fit into everyway) harness is a well crafted harness which ticks all the boxes to become one of the best harnesses on this list. It may not quart have made it to the top of the list but we’ve found that it’s one of the most secure harnesses we’ve ever tried on with our own dog, Jeff. But we’ll get into that a bit shortly. The FIE harness is a stylish looking harness made using quality materials which are tough and won’t be scratched easily because the outer material is made using oxford. The mesh is light and well fitted and the bottom belly later is made using soft sponge which won’t irritate the skin even in hot weather. For security and attachments, the FIE harness has a d-ring on the dog’s back portion and the o-ring on the chest area giving multiple entry points for leads and accessories if you have any. The harness comes in 5 sizes to suit any size of dog and three bright colour – green orange and black. Lastly, we mentioned how this was our most secure harness in our tests (subjective opinion, may not be the case with your dog) because Jeff was unable to wiggle himself out of the harness at all,. This is pretty much because of the strength and tightness of the wire/ropey bits and the positioning of the under belly strap. Usually, dogs wiggle out when they are facing you and you’re pulling the lead towards you. Security aside, the FIE dog harness is still an all round great harness as well and well worth checking out. It has a great price point and looks decent enough when fitted. We bloody love the Truelove no pull harness and found it to be one of the best dog harnesses you can buy. The best part of the Truelove harness is the choice of positioning you have for the leash. You can put it toward the back or the front. The areas on the back makes it much more comfortable for the dog itself and puts no pressure at all on the neck (whole point of a no-pull harness) while still giving you, the walker, total control. Having two leash attachment areas also makes it easier to attach a GPS system which doesn’t come with a native collar on. Anyway, I digress. This harness has a soft pad for the areas which attach to the belly to give extra comfort which can really come in handy on longer walks. The adjustable straps also make it easier to get a perfect fit no matter what size your dog is (you still need to get the closest size to your dog fist though as the straps don’t make the main harness smaller or bigger!). The Truelove harness has reflective areas which comes in handy for a late night walk should they be off lead or god forbid they get lost. On top of this, the Truelove harness is highly durable thanks to its high quality nylon construction which gives you a long lasting harness without the need to replace after a short period of time which you can find with some of the cheaper ones. Please don’t buy the cheap ones, a good quality one is much better value than them. Overall, the Truelove no pull dog harness is up there with the best of the bunch and well worth a look. Has everything you need and more in a harness and perhaps the only deciding factor is whether or not you like the way it looks as opposed to how well it works! If you are an owner of this please let us know your thoughts in the comments below, good or bad! 1.Reflector ensure good visibility at night. 2.Two leash attachment point:stainless steel O-ring on chest and back. 3.Handle on the back:Keeps dogs secure during sudden vehicle movements and allows drivers to focus. 4.Soft Pad in chest and belly for comfortable. The Red Dingo plain strappy harness is an incredibly simple no frills harness but with a difference. It’s one of the highest rated dog harnesses on Amazon with hundreds of reviews so not only has this been tested and approved by JugDog but also by other real people with different breeds so you can be rest assured this is one of the best dog harnesses you can get. It doesn’t look much but there you go, substance over style and all that. Anyway, the Red Dingo harness is made using strong and durable nylon so it can take tug or two, it’s easy to clean as well so it’s ideal for mucky pups. 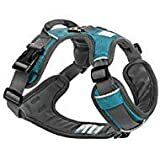 It’s got a simple ‘scrappy’ or belt led design which doesn’t make it one of the most fashionable harnesses but it has been designed to be secure similar to the FIE harness. However, the FIE harness does have softer panels for better comfort hence why we feel this isn’t the best harness but a very good alternative if peer reviews is important to you. It’s easy to make adjustments but not the quickest if you needed to make them outside and in a rush but the bone design buckle is a tie addition if a bit gimmicky. The plated carbon steel D ring is where you’d expect it and tough just like the others. 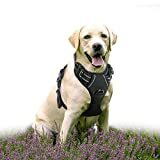 Overall, this harness will do exactly what it says on the tin without much fuss and has been verified as a decent option by hundreds of shoppers on Amazon – this makes it a relatively risk free purchase that won’t blow you away but will keep you and your dog content. And by the way, it’s Red Dingo that call this a plain harness and not us! The Rabbitgoo no-pull harness is one of the most positively reviewed items currently on Amazon with many happy shoppers citing the overall quality, ease of installation, low price and great looks. It’s designed as a no pull harness – the straps distribute the force evenly which doesn’t put any stress on your dog’s neck. 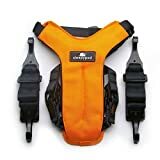 The front chest harness is nice, thick and soft and actually rather stylish we thought, especially if you go for the orange or green colours. This harness comes in sizes X-small, extra small, small, medium, extra large, large and x-large which caters for practically any dog. You can then fine-tune the size to suit with two adjustable straps on the chest and neck – it’s always important that the harness fits perfectly without too much play but not too tight that it becomes uncomfortable. On the back of the harness are two anchor points to further the comfort level for both the dog and the owner. If you decide to walk your dog in the dark it has reflective straps. We found the harness to be quick and easy to put on even though it does look a bit strappy which is fantastic. When we tested this on our dogs we found the fit to be exceptional and the product was well made and comfortable for the dog. When walking the dog the feedback from the harness to the lead was great and we felt that even when we needed to pull the dog back it did not cause any discomfort. We tried to get the dog to wriggle itself out of the harness and luckily he was never able to, therefore we can confirm that this does what it says on the tin! 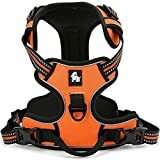 Overall, this is one of the finest dog harnesses on the market and one that has not just been positively reviewed by us but by over 600 verified shoppers on Amazon. The price point for the harness is also extremely generous and you can often get this for a snip at under £30! NO-PULL DESIGN: No stress on dog's neck, pulling pressure is evenly distributed to the body to prevent pulling and choking. ADJUSTABLE & COMFORTABLE: Adjustable Slide Straps (NECK and CHEST) let you create a custom fit for your dog. Thick material with soft padding underneath and breathable lightweight mesh Lining make your pets comfortable. BETTER CONTROL: 2 metal leash attachment points on the harness's back and on the chest. If your dog like running, you could use the back one, if you just walk the dog, you could use the chest one. 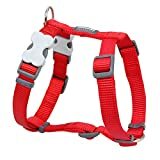 SAFETY FEATURES: Reflective Straps with good visibility ensure your dog's safety while out for a Walk and sturdy handle for looping seat belt through to secure your dog while riding in your car. The dogOne winter coat and harness is a fantastic option as it doubles as a winter coat and a harness which can save money from buying both of them individually. 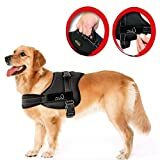 It has built in reflection panels to help when walking your dog in the dark and considering it’s a half winter coat chances are it will be dark. It only comes in black but there are six sizes available so there is perfect size for your dog. The purple lovely heart my dog harness is a stylish padded dog harness. It has a fleece inlining to keep your furry friend warm. It’s mainly catered towards small and medium dogs as it lacks the strength for larger breeds. If you want a harness that’s a bit nicer looking than usual then this is a superb choice at a great price. The OneTigris tactical dog best gets a mention because it’s so tough, robust and has excellent features to keep your dog under control. It may not be flashy like the others but if you want one that gets the job done brilliantly then this is the one for you. It has almost the same features as the Julius-K9 but has waterproofing thrown in and a metal clip for extra safety. Comes in one colour and only two sizes – large and small so be sure to check your dog’s size before purchasing. 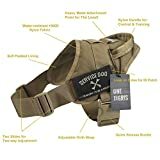 If you want to try a harness but don’t want to break the bank doing so then the COA cheap dog harness might be worth a shot. It may not be the best dog harness to stop pulling or the most comfortable dog harness but it will do the trick. It’s padded, easy to put on and take off but may not be appropriate for long term use. Comes in three sizes and one colour – black. This is an ideal harness for small dogs. Possibly the best dog harness for large dogs, the Lifepul harness is a favourite at JugDog. It’s straps on the front are larger and more padded than the others while it still retains its strength and durability on the top part. It’s got a meaty handle and ring for your lead at the top and it pretty much ticks every box. Only comes in three sizes, medium, large and extra large so this isn’t even an option as a harness for small dog. 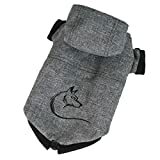 This is a safe and comfortable option for your dog and at its very generous price one we recommend to at least check out. ▶ FUNCTIONAL FEATURES -The dog vest harness leash connector D ring on the back is not only perfect to attach a seat belt to keep the dog safe during travel but also can make a regular leash tied in when you walk or riding easily. ▶ EXCELLENT QUALITY - All the dog vest harness mades of highest quality nylon outside,nickel-plated hardware,thick material with soft padding underneath ,soft,breathable,make your pets comfortable and reduce weathering. Perhaps one of the best harnesses for small dogs is the Puppia soft harness; It’s been approved by veterinarians which is always a good sign! It’s extremely comfortable thanks to its padding and fairly strong (we wouldn’t recommend these for larger breeds, see above for them!). 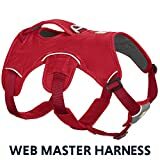 The harness puts no strain on the neck and allows any pressure or strain to spread evenly across the chest. We’ve used one of these on our Jug and due to it’s adjustable strap it fits perfectly, so even if you have a ‘chesty’ breed such as a Pug or Jug then this should be fine. Comes in a myriad of colours so there’s definitely a fit for your taste out there! We love this one at Jug Dog. The Active Dog Harness by Embark is a great harness for highly active dogs who need to be secure at all times without the risk of the harness slipping off them while pulling (it can happen). 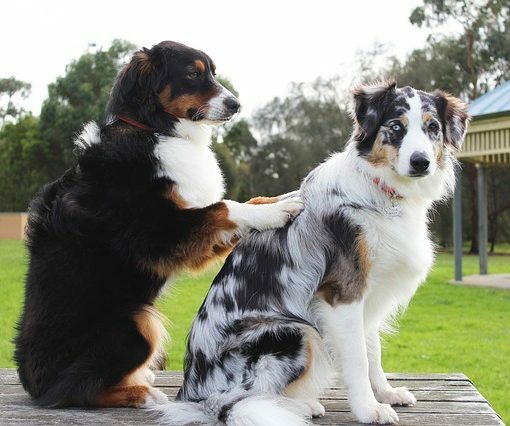 It’s easy to get on in the first place by just slipping over your dog’s head and then adjusting the head and neck. Stylewise it’s also a nice looking harness which is a big plus and your dog will be turning heads on a walk. Lastly, the price point for this harness is excellent considering the high quality harness you’ll get. One to consider for sure. Most harnesses can be used in the car with an attachment which can clip on to the ring and attached to the safety belt, however there are specifically made car dog harnesses you can buy. The Sleepypod Clickit Utility dog harness is a specifically made harness for car travel and one of the best rated harnesses out there. The ‘wide webbed’ design makes it secure and stops your dog from being thrown around in the car during a journey. What sets the sleepypod apart from the rest is the rigorous safety tests and safety passes it has received. Your dog will be just as safe as a human passenger with this outstanding car harness. We simply couldn’t recommend this any more and should be classed as an investment rather than a purchase. Strength tested, automotive grade materials and hardware. A dog harness is different to the traditional collar as it wraps around their body to provide a more robust and comfortable way to attach a lead and walk your dog. Many people now choose harnesses to prevent dogs from pulling or to simply not choke them if they do. Dog harnesses are also good for dog training. Best dog car harnesses are also a great way to keep your dog safe and in place when driving as you can get additional attachments which can work with the safety belt. Dog harnesses are designed to fit comfortably around your dog’s chest and behind the neck. They’re usually designed so that it spreads pressure and tension evenly so that they aren’t pulling and hurting themselves. Working dogs typically wear harnesses so that they can be controlled easier and protects their neck from being tugged harshly which can cause serious issues for the dog. Basically, a harness benefits both the dog and the owner – the dog is held firmly and if they suddenly pull they won’t choke and secondly the dog is held much more securely and in comfort which make being on a walk a much more pleasurable experience. Have you ever seen a dog pulling and sounding like they’re being strangled on a walk? That could be avoided with a harness. Harnesses come in different shapes, sizes, materials and accessories so it can be a bit confusing which one is actually the best dog harness. When we received the harnesses from the generous companies we needed to come up with some points and checks to help grade the harnesses and score them on individual merits before we come up with an overall score. So, here are some important aspects to look for when choosing a harness. The harness needs to be strong and made using durable materials to handle the rough and tumble and not let you down on a walk. By let you down, we mean fail while in use – check to see what the main material is and the strength of the o-ring and take a look for any reviews from users complaining a few weeks, months after a purchase. Is the harness comfortable for the dog? If you need to pull the dog for whatever reason does the force get distributed evenly and not on the neck? These are important points to consider when choosing a harness. We’ve had some harnesses in our time that have been like puzzles to put on and take off. Do yourself a favour and choose a harness that is simple to put on and take off to save time and avoid frustration. It’s the same situation when choosing a baby seat – if you picking that’s ISOFIX it will save you a few minutes a day. By value for money we don’t mean cheap. Don’t get the cheapest or the most expensive just for the sake of it – get the one which gives you a lot of bang for you buck. You’ll notice from our list that our recommend harness is neither the cheapest or the most expensive but the one we felt was simply the best. JugDog.co.uk is and always will be a collaborative community between us, the dog and yourselves and as such we always welcome feedback good or bad. Have you seen a harness on here you have more questions to ask from a certified tester (us) or perhaps you have purchased one from the above and wanted to share your thoughts, good or bad. Perhaps you have a brilliant harness that isn’t even on the list and want us to add? Whatever your thoughts are, we want to hear them! Our comments section is just down below!